Which reface will you choose? reface; an interpretation of classic Yamaha synthesizers and keyboards in a contemporary, on the go format. Light and compact, these four mini synths are perfect for use on the road, on stage or in the studio. Create your sound any place, any time. With the legendary Yamaha Control Synthesizer series, introduced in 1976, music history was written by artists like Vangelis, Stevie Wonder and Michael Jackson. In keeping with tradition, the reface CS unites simple handling and creative sounds with massive dynamic range. But the idea was not to clone a monophonic synthesizer: the polyphonic tone generator, with eight voices and five oscillator types (multi saw, pulse, oscillator sync, ring modulation, frequency modulation), offers a rich bandwidth of exciting sounds from analogue to digital. All parameters are changeable intuitively using sliders. instrument. With the reface DX, all these legendary sounds are back for the 21st century - ready for the new generation of FM sound fans. A carefully-developed user interface offers intuitive access to the FM tone generators even for beginners. A capacitive multitouch controller enables dynamic modifications of the sounds. The reface DX is also polyphonic, with eight voices, and features seven effects. 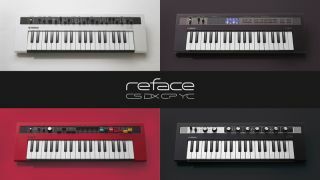 Its design is living proof: The reface CP is a spiritual successor of the unique Stage Keyboards of the '70s. It brings emotional and powerful vintage sounds into today's mobile world without any compromise regarding sound, playability or polyphony. As a Combo Piano, the reface CP offers six classic keyboard sounds of excellent quality thanks to SCM (Spectral Component Modeling) and AWM2 sound generation. Carefully selected vintage effects increase the authenticity of the sounds even further, instantly evoking memories of legendary songs throughout the history of rock and pop (think Keane, U2, Genesis and Billy Joel). Rich, punchy organ sounds are its area of expertise: the reface YC offers additive synthesis paired with a unique level of expression thanks to the nine drawbars and virtual rotary speakers. The instrument combines five different models of organ, and the sound is created using a special "Organ Flutes Tone Generator". As well as giving you the opportunity to carry around five organs in a single piece of hardware without breaking your back, the reface YC also delivers an authentic organ playing experience using the smallest user interface possible. Check out the Yamaha reface website for specs, a range of hands-on artist videos and information on Soundmondo - an online hub connecting the reface community all over the globe as users create, share and discover sounds. For iOS users there is also an app called reface Capture, which lets you store and recall reface voices. You can download this for free from the App Store. All four reface models are available now. For the chance to get your hands on one, click here to enter our competition. Find out more about Yamaha Synths on Facebook, Twitter and Instagram.